Davante Lavell Adams (born December 24, 1992) is an American football wide receiver for the Green Bay Packers of the National Football League (NFL). He was drafted by the Packers in the second round of the 2014 NFL Draft. He played college football at Fresno State. The son of Douglas Adams and Pamela Brown, Adams has one brother and two sisters. From East Palo Alto, California, Davante attended Palo Alto High School in neighboring Palo Alto, California. As a senior two-way starter, he led the school to a CIF state championship. He had 64 receptions for 1,094 yards and 12 touchdowns and as a cornerback on defense he totaled 44 tackles, including two for a loss, two forced fumbles, an interception and four passes defensed. He also played basketball and was considered a two-star recruit in that sport. Lettering all four years in basketball, he averaged 9.0 points, 5.8 rebounds and 5.4 assists as a senior. Adams was recruited by Fresno State, California, Hawai'i and San Diego State. He redshirted as a true freshman at Fresno State in 2011, then in 2012 had 102 receptions for 1,312 yards and 14 touchdowns in 2012. All three led the Mountain West Conference. He also was the conference's Freshman of the Year and a freshman All-American. He was the MVP of the 2012 Hawaii Bowl. As a sophomore in 2013 he led the nation with 131 receptions for 1,719 yards and 24 touchdowns. He set a Mountain West Conference record with his 24 TD grabs, eight more than any player in the country in 2013, and the total ranks No. 4 in single-season FBS history. He also set Fresno State career records for receptions (233) and TD catches (38) despite playing just two seasons for the Bulldogs. He was named second-team All-America by The Associated Press. On December 27, 2013, Adams announced that he would forgo his final two college seasons and enter the 2014 NFL Draft. Adams was selected in the second round (53rd overall) by the Green Bay Packers in the 2014 NFL Draft. On June 12, 2014, he signed a contract with the Packers. After playing in the number four receiver slot for the first game against Seattle, he took 37 snaps in the second game against the New York Jets he had five catches for 50 yards. Entrenched as the Packers' number three receiver, on October 2 he scored his first NFL touchdown on an 11-yard strike from Aaron Rodgers in a 42-10 win over the Minnesota Vikings. On October 26 he had a personal-best seven receptions in a loss to the New Orleans Saints. He tallied his first 100-yard receiving game on November 30 with six receptions for 121 yards in a 26-21 win over the New England Patriots. On October 26, 2016, Adams was named NFC Offensive Player of the Week after catching 13 passes for 132 yards and two touchdowns against the Chicago Bears in Week 7. ↑ "Davante Adams Bio - Fresno State Official Athletic Site". gobulldogs.com. Retrieved 13 December 2014. ↑ "Adams catching on at Fresno State". mercurynews.com. Retrieved 13 December 2014. ↑ Palo Alto Online Sports. "Paly grad Adams ready to build on a great freshman year". paloaltoonline.com. Retrieved 13 December 2014. ↑ "Paly grad Adams has All-American season". paloaltoonline.com. Retrieved 13 December 2014. ↑ "Fresno State Bulldogs' Davante Adams declares for NFL draft - ESPN". ESPN.com. Retrieved 13 December 2014. ↑ "NFL Combine Results". NFL.com. NFL. Retrieved 8 June 2016. ↑ "Davante Adams NFL Draft Profile". NFL.com. Retrieved October 19, 2016. ↑ "Packers sign draft picks Adams, Rodgers". Packers.com. June 12, 2014. Retrieved October 19, 2016. ↑ Behrens, Andy. 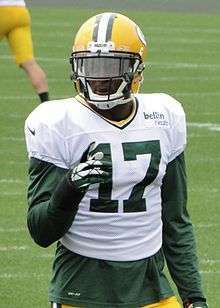 "Green Bay rookie Davante Adams suddenly more than an afterthought". Yahoo! Sports. Retrieved September 16, 2014. ↑ "Davante Adams". Pro-Football-Reference.com. Retrieved 13 December 2014. ↑ "Davante Adams named NFC Offensive Player of the Week". Packers.com. October 26, 2016. Retrieved October 26, 2016.